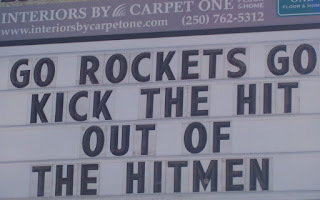 The Kelowna Rockets can win the Ed Chynoweth Cup tomorrow on home ice against the Calgary Hitmen! A big reason for the Rockets' rise in the playoffs is the man between the pipes, Mark Guggenberger. He was the first star last night in Kelowna and you can see him here. The PA announcer heard in the clip is a former radio colleague of mine, Bill Barnes. Bill's day job now sees him as a big part of Enquiro, a privately held search engine marketing firm with ten years of experience in search engine optimization (SEO) and sponsored search (PPC) to make your search engine marketing strategy more powerful. How popular is Mark Guggenberger in Kelowna? A local restaurant called the Grateful Fed had a special last week called the...wait for it....the Gugg-en-berger. What is the Guggenberger? It is a turkey burger with cranberry mayo.